Brainstorming is one of the exercises we use in our Designers daily routine. It is often enjoyable, sometimes exhausting, but always time consuming. We try hard to be concise, to dig deep for the best ideas and use several state-of-the-art techniques of which countless versions can be found on the web. But sometimes we don’t feel satisfied and then have to repeat the session, because we felt that we had perhaps missed a better idea. This is where we came up with the one-hour “Brain Sprint” to address this problem. When starting our Design Sprint journey we realized that it was necessary for us to level up our brainstorming approach. Step by step we changed our meeting culture and developed the Brain Sprint, which we thought could be of value to other designers, too. The expert interview is an exercise from the Design Sprint where we bring the people with specific knowledge into the room. Usually we have the project manager who has spoken to the client as an “expert”, and we suggest to take the design lead in also. Now choose a time limit between 10–15 minutes (depending on the size of the project) and start the interview. The “experts” then explain the briefing and the background, and the team ask questions for clarification, without discussion as yet. The facilitator writes the facts on post-its and sticks them to a “briefing box” on the whiteboard. Why we don’t use the HMWs (How Might We questions): Often we get a briefing from the client with lots of facts and tasks. There is no need to turn these into HMW questions. And we want to keep everything from the briefing, even if this means having a broader starting point. The “experts” present any reports they have (a user research project, or research the expert did before the sprint, interview with an ux-researcher or anything else that gives some user insights to the team) in order to help the team be more aligned to the user point of view. Questions from the team are allowed but still no discussion. The facilitator has an eye on that and at the same time takes more notes and sticks them into the “briefing box” . The lightning demo is an exercise from the Design Sprint, which is like a short research session. With its help browse the internet or pull up some examples from experience. Taking post-its and writing down the name of the related site/product and relevant ideas or actions, we stick them to the wall to inspire the others. It’s advisable to have around 2–3 lightning demos. Each team member has max. of 3 Minutes to present the examples to the team. Just short explanations and again: no comments yet! Put on some nice music to level up concentration. Each participant writes ideas on post-its (one idea per post-it) which are stuck on the wall and read aloud so everybody understands. Give 1 minute to each participant for reading. The facilitator can defer judgements on ideas. Now it’s time to develop upon other ideas, or create new ones. In order not to lose the momentum of the group, be strict with the timing. Again each participant presents their ideas in 1 minute, reading aloud without comments. Each team member gets 6 sticker dots to vote on the most liked ideas. Participants can vote on their own ideas and can put all sticker dots to one post-it if they really like it. But still respect the rule: No discussion allowed. If there are 3 or 4 people in the team (usually that’s our case) then 3 minutes will be okay. If there are more participants, the facilitator can add one or two minutes. When voting is finished, the post-its are rearranged in order of popularity like a christmas tree. The note with the most dots goes on the top. This gives a nice overview of the ideas. It must now be decided what to do with the ideas. What’s the project? Who will the ideas be presented to? We usually divide up the post-its to all the designers in the group and each of them develop a layout. We use the most voted ideas for that and as many ideas as we need. This is also an exercise from the design sprint, executed in a very compressed way. First decide how many ideas are needed, choose the appropriate ideas and begin sketching: For each idea, take a sheet of paper and put on the top a name for the idea to give it a more important aspect. Then rephrase or just copy the idea from the post-it. Add a rectangle below and sketch the idea in a simple and easy way. If prefered, add another colour to decorate, and if necessary, describe in two or three comments what you have drawn. Now the concept sketchings can be shown to others. Design Sprints changed a lot for us. We sell them to clients to innovate their products and services, and also use them internally for our own processes. 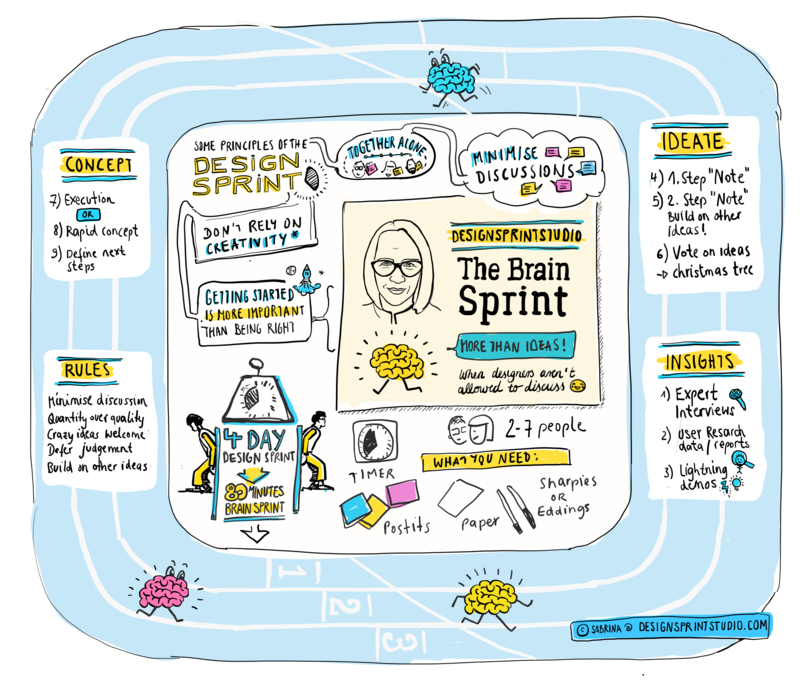 We are very enthusiastic about the Design Sprint format, so it was a natural shift to apply it to a more strategic and concisely structured brainstorming method — our “Brain Sprint”. 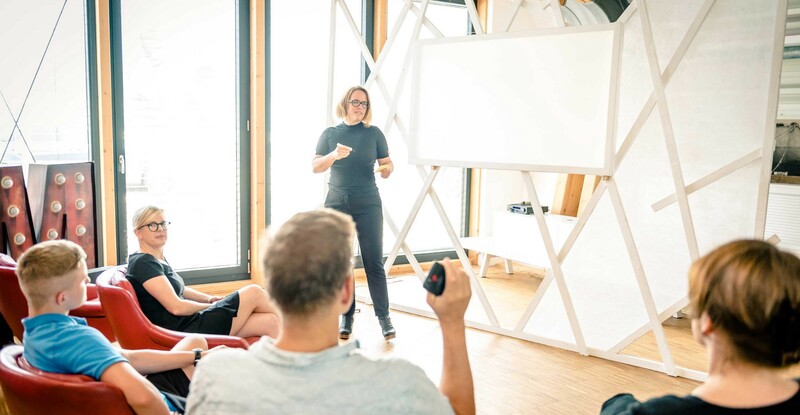 As a design agency with its roots in the classic design branch, and from speaking with other designers, we know very well that many struggle with brainstorming meetings. For us, the Brain Sprint isn’t just a substitute for the brainstorming process. Design Sprints in our organisation kicked off a transformation from the old agency model to a new form of sparring partner for our clients to help them with their digital and future challenges. And it’s a start for communicating and sharing with colleagues and competitors to bring our forces together. There are other suggestions from people I respect a lot like Jake Knapp, who suggests to do a Design Sprint instead of brainstorming (check out https://medium.com/@jakek/stop-brainstorming-and-start-sprinting-16180839b43d) or Jonathan Courtney who wrote an article on how to get ideas for a digital product ( https://bit.ly/2pF1jHf). But in other cases give the Brain Sprint a try! If you have questions or tips of your own, please share them in the comments below. Thanks!